Garages were born for storage. After all, the name comes from the French word garer, meaning to shelter. But "stored" doesn't necessarily mean "protected." A cold, wet garage can wreak havoc on your possessions, which aren't nearly as rugged as you think. Everything from power tools to garden hoses can be damaged over the winter months. So how do you protect these items—as well as the structure itself? 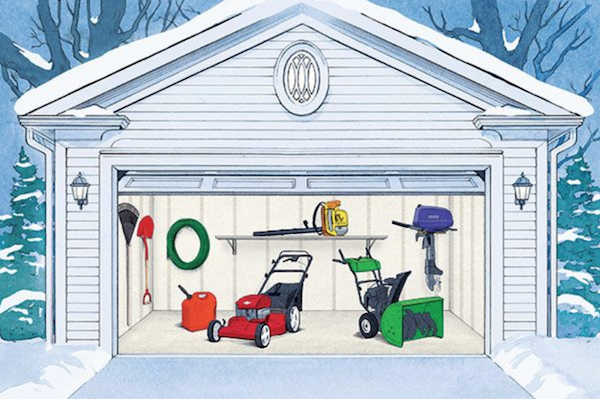 Follow these tips from experts—keeping safety in mind around flammable products and sharp objects—and the things you leave in your garage all winter will be just a little more sheltered. Lubricating metal parts is important in the winter. To keep out snow and add warmth (as well as another layer of protection for valuables), apply weather stripping around the door. A shelter is only as good as its roof, and gutters are key to channeling off water and snow to prevent a winter cave-in. Scoop out gutter gunk, and flush the gutter with a hose. "A good-quality garden hose can cost up to $80 and could last for up to ten years with proper maintenance," says Messervy. Stretch it out on a downward slope to drain water (which could freeze and expand), then coil it up. Clean or replace the air filter and drain the fuel, advises Kris Kiser of the Outdoor Power Equipment Institute. You can use 10% or zero-ethanol gas—but Kiser uses only zero concentration, so any fuel remaining in the tank won't harm the blower. Replacing dirty spark plugs is also good practice (safely disconnect battery cables first). Invest in a spark-plug tester for upkeep. Keep spare fuel in a steel jerrican equipped with a flame arrestor, and label it with the date of purchase; never store it for more than 30 days. Any gas with ethanol will need to be mixed with a stabilizer to prevent deterioration. Clean grass from the undercarriage and sharpen the blades—then run the machine until the gas tank is empty, which prevents corrosion. Do this and "mowers can last up to 20 years," says Kiser. Get it ready for action: Change out last season's dirty oil and add low or zero-ethanol gas (you did drain last season's fuel, right?). Replace shear pins, and check the shave plate for wear. Flush out the engine, and let it drain. Shut off the fuel supply, and treat the engine with fogging spray as it runs out of gas. To store, place it upright without any tilt. A little TLC—changing the oil and lower-unit lube—won't hurt either, according to Charles Fort, associate editor at BoatUS Magazine.